Taj Campton Place, the quintessential landmark San Francisco boutique hotel on Union Square, is now a part of the legendary Taj family of hotels. Located along Stockton Street at the prestigious Union Square, Taj Campton Place is adjacent to the financial district, premier art galleries, prominent museums, and the City’s best-known stores. 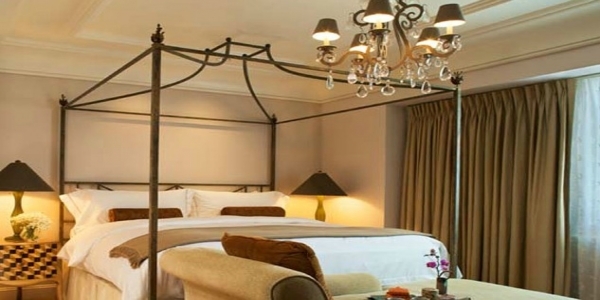 Historic Taj Campton Place is an intimate boutique hotel with classical European style and modern sophistication. For over 100 years it has been a sanctuary for discerning travelers from around the world. The Hotel exudes an ambiance of privacy and warmth, allowing guests to come home to the utmost in personal service and quiet exclusivity. For these reasons and more, Taj Campton Place was Global Traveler GT Tested Awards – Best Hotel in the United States 2010 and earned one Michelin Star for Campton Place Restaurant. The Union Square area has a multitude of options for spa and related services. The Concierge Team would be happy to assist with outside or in-room spa services and appointments. The open-air outdoor fitness terrace is available around the clock for our resident guests. Sitting at the top of the 9th floor, you can enjoy your exercise while capturing a fresh breeze and overlooking the sweeping views of Union Square and the City. Campton Place provides seamless meeting and conference services to ensure the highest levels of creativity, convenience and efficiency for every business need and event. In addition to four perfectly appointed meeting rooms featuring wireless Internet. The Hotel provides a state-of-the-art technology-driven business centre. Arrangements can be made for secretarial services, translations, fax, and other electronic and communication requirements. Private offices are available upon request. 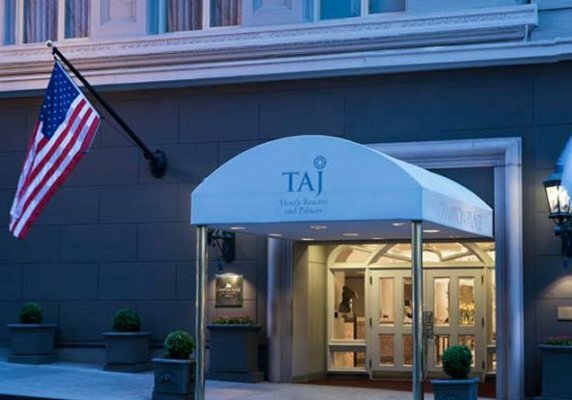 Taj Campton Place provides an elegant setting for hosting high-level meetings and upscale private events. The combination of spectacular locales and the trademark Taj attentive efficiency adds a whole new dimension to conducting business. Strategically located on Union Square, convenient to corporate and business headquarters, and close to freeway access for business appointments in downtown San Francisco, Taj Campton Place is the preferred choice of discerning business travelers to the city. The challenges of business on the road are soothed by the executive-level luxury, white-glove professionalism and comfortable refinement that are central to the Taj Campton Place experience. Whether you are planning a high-profile professional event or hosting a small group of important colleagues, depend on us to provide just the right tenor to the proceedings. The Hotel offers a complete array of business amenities and facilitates a full range of business related services. Arrangements can be made for secretarial services, translations, conferences, facsimile, and other communication needs. The four-star restaurant and the elegantly posh bar are perfect for business dinners as well as an informal tête-à-tête. Private dining arrangements are also available on request. From the moment of your engagement to the joyous day and all the important milestones in between, Taj Campton Place will handle all your wedding functions with flawless aplomb. Consult with our event planner to create an event that will delight the couple, parents and all friends and family who join in the celebration. Whether it’s a traditional wedding shower, rehersal dinner or traditional ceremony, our event team will move heaven and earth to ensure that your wedding is nothing short of perfection. Accommodating up to 100 guests, Taj Campton Places’s illustrious private dining rooms offer an exquisite backdrop for special occasions. We also have our Luxury and Executive suites, featuring views of Union Square, available for cocktail receptions. Taj Campton Place features 110 richly appointed guestrooms, including nine spacious suites with state-of-the-art technology. Recently redesigned to provide the ultimate in comfortable luxury, Taj Campton Place’s rooms and suites are light, airy, uncluttered and fitted with meticulous detailing to insure peaceful relaxation just steps from all that vibrant Union Square offers. The feel is more akin to an impeccably designed residential oasis than a hotel. Stylishly sophisticated interiors composed by award-winning designer Sylvia Chiang feature handcrafted, artisan-quality hardwood furniture, leather-topped writing desks, lavish pure cotton linens and toweling, thick down-stuffed duvets and beautiful limestone-tiled bathrooms with deep soaking tubs. Each room offers a king sized bed with Frette linens and is decorated with pear wood paneling. A window seat or chaise lounge encourages relaxation in front of a large flat screen HD television. These rooms measure 225 to 250 square feet. Some with spacious window seats, these warmly decorated rooms feature king sized beds topped with premium Frette bedding, and encourage relaxing baths in the elegant limestone bathrooms. These rooms measure 325 to 360 square feet. A good idea is worth repeating. Each deluxe double double offers two double beds and gorgeous natural pear wood paneling. An elegant limestone bath features either a separate shower or one combined with a deep soaking bathtub, ideal for any traveler’s needs. These rooms measure 390 square feet. The parlor is tastefully appointed with a sofa bed, easy chair, coffee table and leather topped writing desk. The adjoining bedroom features a California king bed and a window seat with breathtaking views of the City and Union Square. These suites measure 460 square feet. The living room, with a spacious conversation area, sofa bed and elegant dining table that seats six, is suffused with light overlooking the cityscape and Union Square. The entry foyer gracefully separates a powder room by a glazed sliding panel from the elegant limestone bath adjoining the bedroom. These suites measure 759 square feet. The top floor has been transformed into a 1,170 square foot luxury suite with a living area partially opened to a formal dining room for eight with buffet and breakfront by Baker. A separate pantry area allows for private service to the dining room and there is an adjacent library for an after-dinner cognac. The bedroom features a four-poster bed by Initials, and is luxuriously draped in silks and strewn with pillows. Bay area residents exhibit a passionate intensity in regards to food. Chefs and ingredients are regular topics of spirited conversation. Over small plates of artesinal cheese and local produce, notes are compared and coveted reservations flaunted. Everyone wants to be privy to the latest opening, the newest wine bar, and the latest review of even an old favorite. Our patrons already know that in the most high profile culinary city in the world, Campton Place restaurant stands out. Here in our own restaurant and bistro, the local bounty is celebrated in our new menu. Chef Srijith Gopinathan and his amazing team have created a menu that showcases his preference for wild, organic and free-range produce that results in incredibly well-balanced cuisine that emphasizes the seasons of California. It’s as if Chef “Sri” (as we call him and you may too) followed the spice route and returned home to delight us with the four-star results of his travels. We invite you to enjoy a meal or two with us, whether it’s a luxurious breakfast, a casually elegant lunch, or a truly memorable dinner. Should you require a special dietary intake of certain food groups, please inform us and we would be more than happy to tailor a menu to your needs and specifications. Every day, we reach for the stars. And then, one fine day, we grab one. In its annual dining guide for 2011, Michelin has awarded a star to the Campton Place Restaurant. It is indeed an honour, both for the restaurant and for the hotel and we thank our guests for it. More so, for Chef Srijith Gopinathan who has painstakingly put together a menu inspired by the marriage of Euro Californian sensibilities and the spice route influence. His flavours are intricate, complex and delicious. From Dungeness crab paired with caviar to an exquisitely fresh piece of arctic char served in a silky mussel vichyssoise, the choices are unparalleled. A selection of five-course tasting menus, a la carte offerings and a special nine course degustation menu is available for dinner. Breakfast: Monday to Friday: 7:00 a.m. to 10:30 a.m., Saturday to Sunday: 8:00 a.m. to 11:00 a.m. Lunch: Monday to Friday: 11:30 a.m. to 2:00 p.m., Saturday: 12:00 p.m. to 2:00 p.m.
Brunch: Sunday: 11:30 a.m. to 2:00 p.m.
Dinner: Monday to Thursday: 6:00 p.m. to 9:00 p.m., Friday to Saturday: 6:00 p.m. to 9:30 p.m.
Sunday: 6:00 p.m. to 9:00 p.m. This intimate bistro and bar is one of those rare places that’s just as suitable for business as it is for gatherings with more personal overtones. The sophisticated club ambience is a nice backdrop for casual meetings, or catching up with friends after a long week. In addition to the encyclopedic selection of fine spirits and liquors, specialty cocktails and over forty wines by the glass, the bar offers a bistro menu with what may arguably be the city’s best burger. Special late dining and post-theatre dessert tastings are available. Hours: Monday to Sunday: 10:30 a.m. to 12:00 p.m. Meals: Monday to Sunday: 11:30 a.m. to 10:30 p.m.